J. CIC PROCEDURES IN HANDLING A CONTRACT. K. ADDITIONAL FUNCTIONS OF CIC. L. HUNTER/KILLER OPERATIONS WITH FAST CARRIER TASK FORCES. Hunter/killer operations are combined air-sea actions against enemy submarines. An offensive hunter/killer unit, normally a task group composed of one CVE or CVL and six to ten DD's or DE's, searches out, tracks down, and destroys submarines. Hunter/killer operations are one phase of antisubmarine warfare (ASW). DD's/DE's from the screen are vectored by CIC to the scene of the contact. When the DE's reach the contact area, they are coached into position to make a sound or visual contact by the planes. After making contact the DE's attack according to prescribed doctrine until the submarine has been destroyed. During the period that the DE's are attacking the submarine the planes remain in an orbit over them to assist in any way possible. They are in radio communication with and are controlled by the DE's making the attack. Good team work by the DE's and the planes aids in getting a definite kill. After the submarine has been destroyed all attacking units are homed. The search patterns followed by hunter/killer planes are very carefully planned with due regard for visual and radar limitations and the probability of encountering submarines in the area being searched. Modern submarines normally operate submerged during daylight and surface at night for as short a time as possible in order to recharge batteries and ventilate the boat. Snorkel equipped submarines may be expected to remain submerged at all times, coming to snorkel depth only for brief periods. Therefore hunter/killer operations must be carried out on a 24-hour basis. In conducting night flight operations from carriers it is important to design the search plan in such a way that the navigation is as simple as possiblee It is also essential that the pilots obtain frequent checks on the position of the carrier. The following search plan is considered one of the most efficient consistent with these requirements. 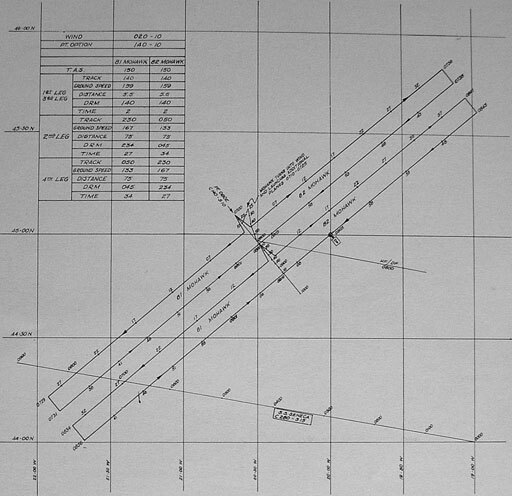 A basic flight plan is shown as it appears on the DRT in figure 13? and as it appears on the relative plot in figure 138. Two planes take off together and fly duplicate tracks on opposite sides of the base course of the task group. w=maximum distance of search from base course. a= length of leg paralleling base course. Vc=speed of advance of task group. When any three of these factors are known, the fourth can be determined by the formula. It is desirable to limit the length of a to twice the distance of visibility in order that visual coverage of the entire area being swept can be had. When a is so limited, the maximum length of w is also limited. Additional search patterns may be found in USF 8. Any plan may be modified by the OTC to meet existing circumstances. During search operations both a DRT plot and a relative plot are maintained in CIC, showing at all times the location of each search plane and the position of each DD/DE in the group. 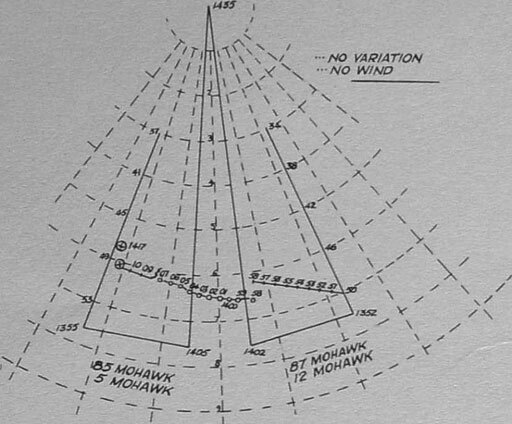 Radar plots are used whenever possible, with dead reckoning employed to track the planes below the radar horizon. The DRT should be set on the largest scale possible commensurate with the size of the area to be searched. 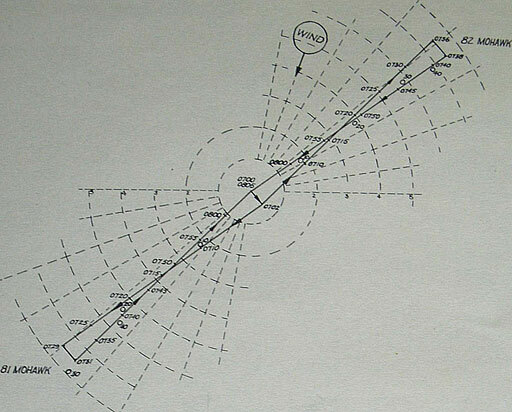 The prescribed search pattern should be drawn on the DRT, and any marked deviation of the actual track from the intended pattern should be noted and brought to the attention of the OTC, Ground speed rather than air speed must be used in dead reckoning planes on the DRT. If radar silence is in effect, plots must be maintained entirely by dead reckoning. The DRT plot should also contain land areas, other friendly forces, recent or expected enemy contacts and any other pertinent data desired by the OTC. All friendly submarine lanes and the location of friendly submarines should be plotted on the DRT as well as on a separate chart of the area. In addition the DRT plot should also contain evaluated intelligence on submarine locations obtained by RDF, radar search receivers, and plots from ashore. AEW information is, of course, plotted with other search information if it is pertinent. 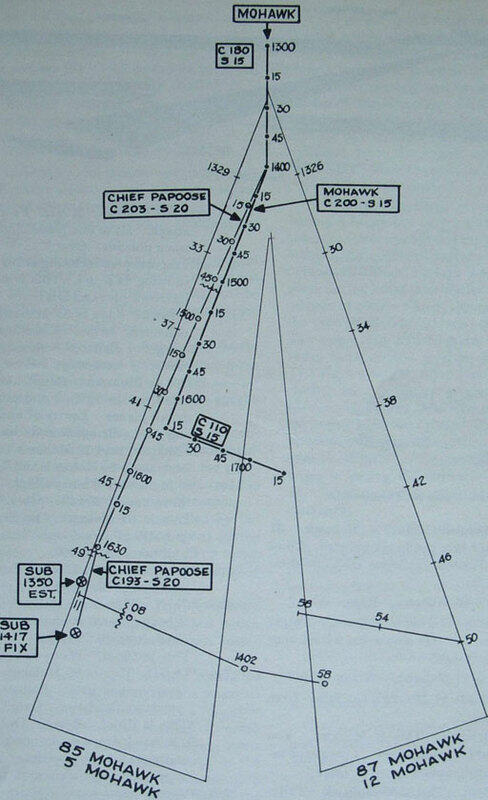 If the ship deviates substantially from "Point Option," or the course on which the planes have based their navigation, the picture on the DRT is not distorted. the DRT plot, dead reckoning must be employed to track the searches below the radar horizon. The planes must be dead reckoned along the relative track, at the speed and in the direction of relative movement. If the task group is changing course or speed, it is desirable to correct the relative track with plots taken from the DRT. Carrier, screen, and planes are all equipped with voice-modulated VHF/UHF radio equipment. Two VHF/UHF frequencies are generally employed in hunter/killer operations. One of these frequencies is common to all units, the other is used solely for intership communications. HF is assigned as standby for the VHF/ UHF and guarded by all units involved. This is to be used only in case of emergency or when directed by the OTC. Under conditions of strict radio silence, communications can be maintained over very short range by visual methods. The planes can use message drops, blinker, hand signals, and radical maneuvers. Ships can use flag hoist, blinker, and occasionally puffs of smoke or steam. In addition, the planes can use their IFF for communications to a limited extent. When search planes are beyond VHF/UHF range of the carrier, a plane, called an "Auto-cat," may be stationed above the ship or between the ship and the plane in question for relaying messages on VHF/UHF. Standard procedure requires that the pilot shift to a specified IFF code when a contact has been made. If for any reason there is doubt about identity of the particular plane which has the contact, further verification can be obtained by ordering the pilot to energize his "G" band equipment. When IFF only appears on the screen, it can be used to get an accurate distance, and the bearing can sometimes be obtained'from D/F equipment. During normal search operations, conditions of radar silence permitting, a continuous search is maintained on the air-search and surfacesearch radars from sunset until one hour after sunrise. YE/YG and YJ are operated as navigational aids to the pilots as long as planes are air borne. When a plane makes contact with the enemy, the procedure followed by the CIC officer will depend upon doctrine as set forth by the OTC and conditions of radio and radar silence obtaining. If, as is frequently the case, radio and radar silences are relaxed as soon as contact is made, the CIC officer's problem is much simplified. In that case, the plane will make a contact report in plain language or in simple voice code. This report should be made, unless absolutely impossible, before the plane goes into attack. This insures against the possibility of the plane Deing damaged by AA to such an extent that it is unable to make a report. horizon, but he must not climb so high that he loses contact with the enemy. The directing of additional planes to the scene will be in accordance with the operation order or orders of the OTC. Many CVE hunter/killer group commanders have found it advantageous to give the CIC officer standing orders to direct the nearest air-borne plane to the scene as soon as contact is made. This eliminates the delay inherent in alerting the OTC and awaiting his orders, and on many occasions has saved valuable minutes in getting reinforcements to the scene of a contact. When so directed by OTC, CIC directs two or more H/K vessels from the screen to the contact area. Orders of the OTC are generally put out from CIC. The surface attack group of H/K vessels maintains a complete, duplicate CIC plot in each ship. Upon arrival at the scene of action the senior vessel takes charge of the aircraft at the scene. During the progress of an attack, the CIC must keep track of all forces, both air and surface, aid in joining them up when necessary and coordinate their efforts. Pilots of relief planes are thoroughly briefed on the tactical situation prior to take-off, and the planes are directed to the scene of contact by CIC, using air control methods. When the submarines have been destroyed, it may be necessary for CIC to home both the planes and the DE's. When the first attack is made. Time and type of each attack. Number, time, and axis of pattern of sono-buoy drops. Time arrival of H/K vessel at scene of contact. Times and types of H/K vessel attacks. 2. The commanding officer must be kept informed of the progress of the attack throughout the entire operation. 3. The DRT must be kept up to date and show a complete picture of the operation. Provisions for hunter/killer operations are made by fast carrier task force commanders purely for defensive purposes. The task groups fly antisubmarine patrols during normal operations. When one of the planes makes a submarine contact, additional planes are ordered to the spot, and destroyers from the screen are ordered to join in the attack. Unlike the offen-sive hunter/killer group, the fast carrier task group proceeds on its mission, leaving the planes and destroyers behind. The planes must, of necessity, return to the group when their fuel runs low, and frequently it is not considered practicable to launch relief planes. The destroyers, however, may remain in the area for a considerable length of time and rendezvous with the group the next day. Conditions.--81 Mohawk and 82 Mohawk are conducting a search as shown in figure 145. Radar silence is in effect and planes have been dead reckoned completely around their sectors. Note that intelligence reported a D/F fix at 45°N, 20°W during the night and that at 0800, the carrier made an HF/DF contact on bearing 100°. Also note that a neutral ship was reported at 44°N, 19°W at 0000 on course 280°, speed 15 knots. Actual direction of planes will usually be from an intercept plot. This plot shows the same search plotted on the DRT plote Note the plots obtained from the DRT at times, 10, 20,30, and 40. Deviation of the carrier's course from point OBOE causes these plots to vary from the original dead reckoned track of directions of relative motion based on point OBOE. Figure 137.--Typical DIT plot of hunter/killer operation. Past DR tracks on the intercept plot are erased to keep the plot clear. 1350-- "Mohawk. This is 85 Mohawk. Contact. One submarine bearing 205, 60 miles. Over." 1351-- "87 Mohawk. This is Mohawk. Vector 280, 50 miles for contact. Over." "This is 87 Mohawk. Wilco vector 280. Out." 1352-- OTC is informed of contact and vector. CIC goes to partial GQ. OTC decides not to launch additional planes. 1353-- DRT places contact at 201, 51. 1354-- SK reports screen clear. "87 Mohawk. This is Mohawk. Angels 8. Over." Figure 138.--Typical intercept plot of hunter/killer operation. "This is 87 Mohawk, Wilco Angels 8. Out." 1355-- "Mohawk. This is 85 Mohawk. Have attacked with automatic weapons, rockets, and depth bombs. Sub damaged. Still on surface. Have two rockets, 1 depth bomb. Bequest instructions. Over." "This is Mohawk. Stand by. Out." 1356-- "85 Mohawk. This is Mohawk. Withhold attack until 87 Mohawk joins you, unless target starts to submerge. Over." "This is 85 Mohawk. Wilco. Out." 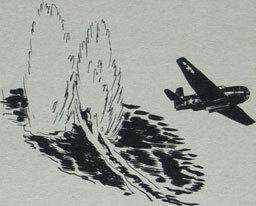 1358-- SK reports 1 or 2 aircraft at 174,66 miles, presumed to be 87 Mohawk and 12 Mohawk. 1400-- OTC decides to send two DEs to scene of contact They are directed by TBS or flag hoist on course recommended by CIC. They are tracked on DRT until out of radar range; then dead-reckoned to scene. Task group also changes course to close contact. 1402-- "87 Mohawk. This is Mohawk. Vector starboard 295. Target ahead 20. Over." "This is 87 Mohawk. Wilco vector starboard 295. Out." Figure 140.--Intercept plot of a typical search. 1403-- "85 Mohawk. This is Mohawk. 87 should join you in six minutes. Chief and Papoose (calls for DE's) on their way." "This is 85 Mohawk. Roger. Out." 1406-- "87 Mohawk. This is Mohawk. Target ahead 10. Go down for visual contact. Over." "This is 87 Mohawk. Wilco. Out." 1408-- SK reports 87 Mohawk has faded from screen. 1411-- "87 Mohawk. This is Mohawk. You should be over target. Commence expanding square search. Over." 1413-- "Mohawk. This is 87 Mohawk. Tallyho two aircraft orbiting sub on surface. Over." "This is Mohawk. Roger. Proceed with attack. Have one plane climb for fix when possible. Over." 1417-- SK reports plane orbiting at 202,56 miles showing IFF #4. This is plotted on intercept plot and DRT. 1420-- "Mohawk. This is 85 Mohawk. Have delivered second attack, sub submerged. Believed damaged. Sub noises on sono-buoys. Over." 1422-- Controller checks fuel and ammunition on all planes. Leaves 87 and 12 orbiting area. Brings 85 and 5 back to base. 1500-- 87 Mohawk and 12 Mohawk relieved on station by 86 Mohawk and 7 Mohawk. 1545-- "86 Mohawk. This is Chief. Believe I have you at 200-25. Over." "This is 86 Mohawk. Roger. Believe sub still in area. Out." Chief takes course 200. 1615-- Task group about 25 miles from contact remains in that area. 1630-- "Chief. This is 86 Mohawk. See you. Change course 10 degrees port. Contact ahead 10. Over." "This is Chief. Wilco Port 10. Out." 1700-- "Chief. This is 86 Mohawk. You are over contact area. Believe sub 1,000 yards south of you. Over." "This is Chief. Roger. Out." 86 Mohawk drops smoke bomb on his best estimate of sub position. DE's commence appropriate search plan. 1720-- Papoose gains sound contact DE's attack. Sub brought to surface with depth charges and destroyed. Figure 141.--DRT plot of a typical search.